Joe Murphy won the Stanley Cup and played 15 NHL seasons. Then he became homeless. Joe Murphy has been tucked away in small-town Canada after playing 15 seasons in the NHL. He has suffered multiple concussions; his behavior is erratic. KENORA, Ontario — Joe Murphy hunches over, unable to speak, unable to respond. His eyes float to the back of his head. His forehead creases with wrinkles. Frozen in place. Still strong and athletic, the muscles in his arms tense. His hands contort, his fingers curl and lock in place, becoming rigid as a brick. Down the right side of his neck, there is an old scar, near the jugular, where he says he was knifed. Murphy, who was the No. 1 overall pick by the Detroit Red Wings in 1986, starts mumbling under his breath and rocks back and forth. His head is nearly bald, his face weathered, like an old piece of wood that was forgotten and left outside. He springs up, pulls out a bungee cord and whips it over his head, the metal hook whizzing through the air, around and around, like a helicopter blade. He uses this bungee cord like a pair of suspenders to hold up his pants, but he also can turn that metal hook into a weapon. He is barefoot, his jeans rolled up over his knees. He wears a black winter coat. It has a hole in the side and every time he moves, puffs of feathers float in the air, out on their own. Murphy lets his head drop to the ground and he slips into gibberish, his head rocking back and forth. Murphy, 50, earned more than $13 million while playing 15 seasons in the NHL — he was on Michigan State’s 1986 NCAA Championship team and played for the Wings for parts of three seasons — but he has been homeless for more than a year in this small tourist town in Canada. Nobody is exactly sure how he got to this point, how he ended up homeless. But there is a nip in the air, winter is on the way and he is in a dangerous situation. You can’t force him to get treatment or counseling, or sleep in a shelter. Instead, he sleeps on a durable blue blanket under a gas station sign. 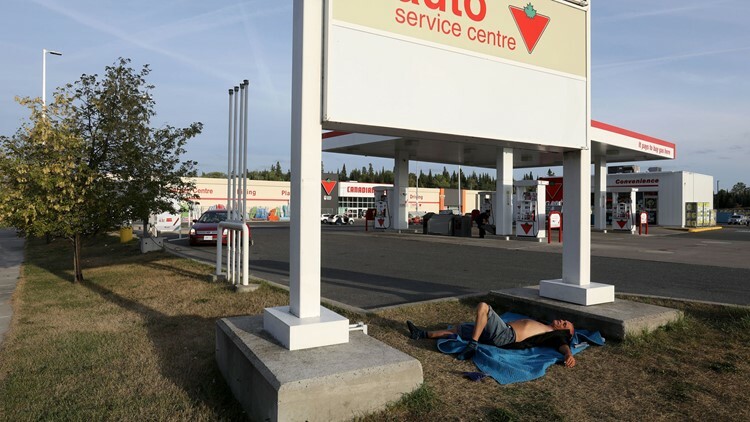 Joe Murphy takes a nap underneath the Canadian Tire gas station sign in Kenora, Ontario, Canada. You can’t force him to reconnect with his family — they have been estranged for years. You can’t force him to accept all the help that his family and former teammates have tried to give him. You can’t force him to do anything. He admits to past drug use. “I’ve done crystal meth,” he says. After suffering a series of concussions in the NHL, his personality changed. The end of his NHL career was filled with odd and erratic behavior. Does he have chronic traumatic encephalopathy (CTE), the degenerative disease believed to be caused by repeated blows to the head? Over the years, Murphy has displayed several symptoms associated with CTE — difficulty thinking, depression, short-term memory loss, emotional instability, substance abuse and suicidal thoughts. Murphy stands at the heart of several issues, at the epicenter of sports and mental health. No matter the cause of his mental illness, if he is not a danger to himself or others, he is free to live on the fringe of society. He can float along, refusing help, choosing to live on the edge of the Canadian wilderness, out on his own, like a single feather popping out of an old down coat. Even if he can sense something is wrong. Sitting down outside of Luby's Food Store in Kenora, Ontario, Canada, Murphy stares out into the distance. At times, he is completely coherent and fully engaged, able to remember details of playing at MSU, or in the NHL, or living in Michigan. At other times, he slips away from the present day — it's like he is living in the past and an old movie is playing on a loop in his brain. And now, he is standing on a street, looking over his shoulder in this small tourist town. He looks worried. “Who are you looking for?” he is asked. Murphy glances down the street again. It’s a long block with restaurants. Groups of tourists and fishermen amble down the sidewalk. And for that fleeting moment, he is back playing hockey. Joe Murphy sits on a set of bleachers, next to a baseball field in Kenora, a short walk from the gas station where he has slept for most of the summer. “What are your memories of playing for the Red Wings?” I ask. Murphy stands up and walks to the end of the bleachers. He hunches over and cries, taking several deep breaths for about 25 seconds. He is overcome with emotion, thinking about going to the Montreal Forum in Quebec with his family as he was taken by the Wings with the first pick in the 1986 draft. Birds squawk in the distance. Then, he snaps out of it. “Does it make you sad or happy?” he is asked. Murphy was a golden child on skates — fast, skilled and talented — effortless on the ice and a natural scorer. His teammates at MSU would sit and just listen to him skate. It just sounded different, how his blades cut into the ice. Murphy seemed destined for stardom in the NHL. He dominated at every level from youth hockey to college hockey and at the world junior tournament, against the world’s best 18- to 20-year-olds. He was a clear No.1 in the eyes of the Red Wings scouts, even though many fans wanted them to pick Jimmy Carson, a local star from Grosse Pointe Woods, who was taken No.2 overall by the Los Angeles Kings. But the Wings took Murphy. He laughs, then begins to rattle off memories, as if they’re flashing in front of his eyes. He has a rich memory. But those memories flow out like waves hitting a shoreline, and everything gets churned together — his college career and memories of his grandparents and the start of his NHL career in Joe Louis Arena and all the different emotions. 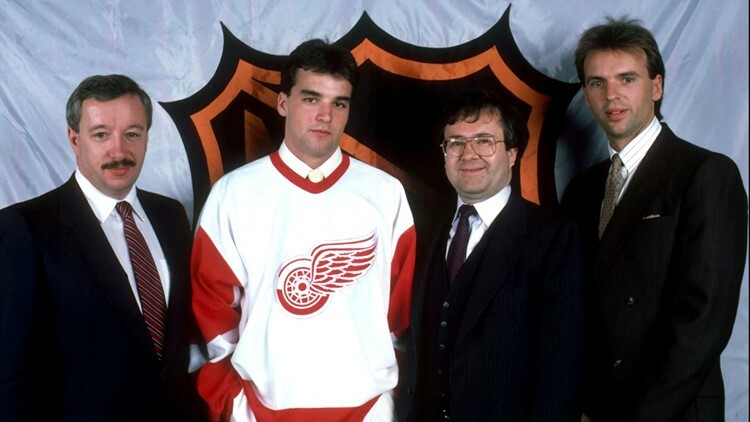 Joe Murphy on draft night in 1986 when he was selected by the Detroit Red Wings. Murphy was given a sweater with No. 10, the same number worn by Delvecchio, a Hall of Famer. Murphy found it intimidating. “I was like, ‘Oh, no, I haven’t done anything,’ ” he says. Murphy tells his story the same way he has lived his life — all over the place. He bounces around from topic to topic, as he has bounced from city to city across Canada, and suddenly, he is talking about the Adirondack Red Wings, which at the time was the Wings’ minor league affiliate in the American Hockey League. Suddenly, without being prompted, he starts talking about playing in a series against the Hershey (Pa.) Bears. Sure enough, Adirondack beat Hershey, 4-3, in the semifinals on the way to winning the 1989 Calder Cup. Murphy’s long-term memory is incredible. He can remember specific details about games and trades and players and goals. Then, he turns to me. His short-term memory fades in and out. “It’s not gonna sound good, guys,” he says, full of embarrassment and contrition. Murphy was involved in a fight in Sioux Lookout, a town of about 5,600 in northwestern Ontario, in April. He was charged with assault, according to court records obtained by the Free Press. Murphy was transported by police to Kenora for a court appearance. After he was released, he fell in love with this fishing town located on the northern shoreline of Lake of the Woods — a massive body of water nestled between Ontario, Manitoba and Minnesota. Peppered with islands, it is the sixth largest freshwater lake located, at least partially, in the United States. Everything in Kenora revolves around the lake. It is a tourist town with a blue-collar vibe where nature, homeless people and tourists have found a way to coexist. It is common to see deer come out of the woods, meander down the street and stand on lawns, eating grass. They aren’t spooked by cars or people. His eyes beam, charged up. It’s like there is electricity running through his body, through his brain. Joe Murphy has been living in the small town of Kenora, Ontario, Canada. 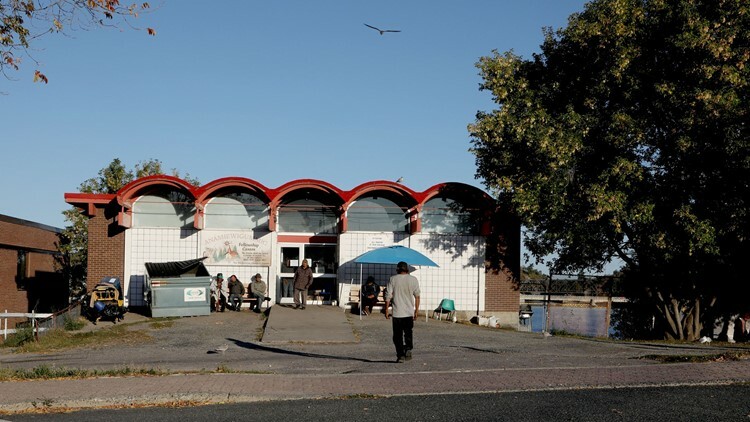 Kenora is a town of about 15,000 with a single McDonald’s but several churches, shelters and centers that offer free meals or places to stay for homeless people. You can find homeless people almost everywhere you turn in Kenora, sitting on street corners or huddled in doorways. It is a historic problem that dates back 50 years. The root of the issue is the lack of affordable housing. But it is far more complex than that, ranging from substance abuse to mental health issues. The town has built a strong system that provides shelter and food. There is no exact count, but about 100 people go to a center next to the courthouse to get free coffee, meals, showers and clothing every day. Most of the homeless people are familiar faces to the authorities. When Murphy showed up in Kenora, he immediately attracted the attention of the Ontario Provincial Police. Duggan says his officers have had no problems with Murphy. When the officers found out who he was, they were stunned. Others Googled him to watch his highlights on YouTube. “There are a lot of officers who grew up in that era of hockey and remembered who he was,” Duggan says. Kenora is a hockey-obsessed town, and hockey players are treated like heroes. About a 10-minute walk from where Murphy has been sleeping at the gas station, there is an indoor hockey rink with a huge banner on the outside proclaiming Kenora as the birthplace of Mike Richards, an NHL player and 2010 Olympian. The small, matted patch of grass is basically his bedroom and he keeps the area clean and tidy, cleaning up after himself, throwing away his trash and folding his blanket when it’s not in use. Murphy is good at being homeless, just as he was good at playing hockey. It took a certain amount of practice, but he has mastered it. He has learned how to bounce between different shelters and churches, always finding a way to get a meal and clean set of clothes. He has learned to be industrious, ripping apart a plastic lid at McDonald’s, forming it into a sharp triangle and turning it into a toothpick. He has learned how ATM machines give off heat in the winter, and how to burrow inside industrial-sized garbage containers. Murphy prefers living on his own. He doesn’t like to deal with large groups in the shelters. But summer is slipping away. Kenora is more than 400 miles north of Minneapolis, and the winter in this area is blistery cold, snowy and overcast. 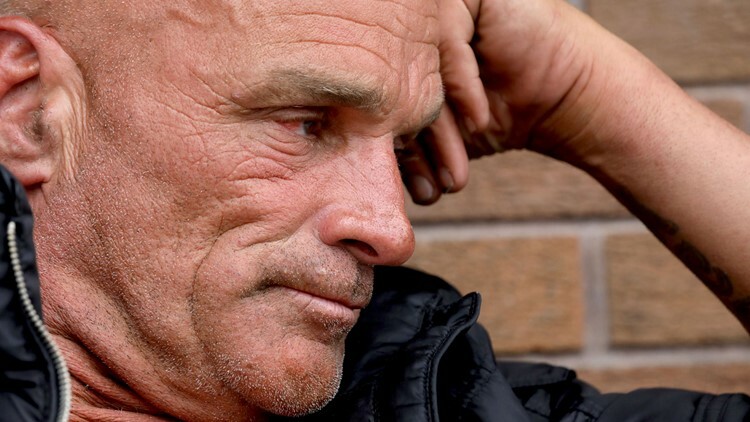 Joe Murphy closes his eyes in pain. He makes a fist and rubs his knuckle over his forehead. Something is not right. He has frequent headaches, wild mood swings and personality changes — all symptoms associated with CTE, which typically is diagnosed in death. “Do you remember your first serious concussion?” I ask him. Murphy was playing for Edmonton against the Red Wings on Jan.9, 1991 — one season after he helped the Oilers win the Stanley Cup. He had the puck and came around the back of the net in Joe Louis Arena. Shawn Burr, the Red Wings’ left winger, hit Murphy with a body check. Murphy lifted into the air and his head hit the railing. Murphy was helped off the ice. He went to the dressing room and was disoriented. He returned to the bench after the injury. Murphy re-entered the game in the second period and remembers going on a breakaway. His vision was messed up. “I saw like 25 goalies,” he said. “I fired it into the glass. Everybody is waving the flags, get the (expletive) off. They got me off the ice and rolled me into the dressing room. Done. I was in bad shape, man. I was in bad shape the whole season. I felt lazy, lethargic, I got a little sick. I just didn’t feel good. My energy was gone. Murphy is unsure how many concussions he suffered during his career. But he is certain of one thing: After suffering that first concussion, they became more frequent. “How many concussions did you have?” I ask. Rightwinger Joe Murphy of the Edmonton Oilers (left) and a Los Angeles Kings player tangle up during a game at the Great Western Forum in Inglewood, California Dec. 15, 1990. He loses his train of thought. Suddenly, he says he has two brain tumors. He is convinced of this because he went for medical tests and overheard a worker talking. “I heard him say there were two in there,” Murphy says. In this moment, Murphy is convinced that he doesn’t have long to live, even though he has never been diagnosed with brain tumors. Without warning, he changes the subject again and dips back into a hockey memory, about a leg injury. “He was not like this when I knew him,“ his ex-wife, Julie Murphy, said in a TSN interview. "There was no unusual eccentric behavior." The Free Press contacted Murphy’s family multiple times, but his sister, daughter and ex-wife declined requests for interviews. Joe Murphy walks down the street in Kenora, making wild hand gestures, waving his arms and hands, like he is trying to swat at a bee. He talks to himself, walking across a bridge, as he passes a woman. The woman stops, turns around and looks at him, clutching her purse. Murphy bounces between emotions, going from dead silence to vein-popping screams. He can be bigger than life with a booming laugh. Then, he can go into a silent, rigid state, staring at the ground. What role do concussions play in the symptoms he has experienced and how he ended up homeless? It is unclear. NHL commissioner Gary Bettman has denied any link between repeated concussions and CTE, which has been discovered in more than 100 deceased athletes, most of them football players. More than 4,500 former NFL players sued the league, accusing it of concealing the dangers of concussions. The NFL ended up agreeing to a historic billion-dollar settlement to resolve the lawsuit without admitting guilt. Which leads to the question: Is the NHL culpable for Murphy’s problems? Now, Murphy and the other players must pursue claims against the NHL on their own, and Murphy’s individual lawsuit could be picked as a "bellwether" case — something like a test case  — and could start as soon as the spring or summer of 2019. At least seven former NHL players have been diagnosed in death with CTE — Reggie Fleming, Rick Martin, Bob Probert (who played with Murphy in Detroit), Derek Boogaard, Larry Zeidel, and Steve Montador and Jeff Parker. Parker’s situation is oddly similar to Murphy’s. They were teammates on the MSU national championship team. After playing in the NHL, Parker lost his savings and spent several years homeless around St. Paul. He had problems with his memory, impulsivity and struggled with bright light, according to a story published in the New York Times in May. After his death in 2017, Parker was found to have CTE by researchers at the Boston University CTE Center, the world’s leading institution on the subject. ''There was a change in that lighthearted kid who left White Bear Lake and the one who came back from the NHL,'' Scott Parker, Jeff's older brother, told the New York Times. In the same way, friends and family saw a change in Murphy. The clues can be found in a string of stories that date back to his time with the Wings. The Wings were expecting him to become a superstar, someone who might transform the game, but he scored just 11 goals playing parts of three seasons. Fans turned on Murphy, many of whom had wanted the Wings to take Carson. While Murphy struggled, Carson became the only teenager other than Wayne Gretzky to score 50 goals in a season, which only increased the pressure on Murphy. He was called “rebellious” and “immature.” He missed a bus, a plane and a curfew during Detroit's training camp. At the time, MSU coach Ron Mason was forced to defend Murphy. "You can't imagine the calls I get asking me if Joe Murphy is a bad kid," the late coach told the Toronto Star. "Everyone wants me to call him a jerk, or worse. What I've told them over and over again is that he's a good kid — and he's still a kid. Joe is a good-natured, fun-loving teenager. He wasn't late for anything at Michigan State because the college environment is easier, living with your teammates. It's a lot tougher on your own in pro hockey." 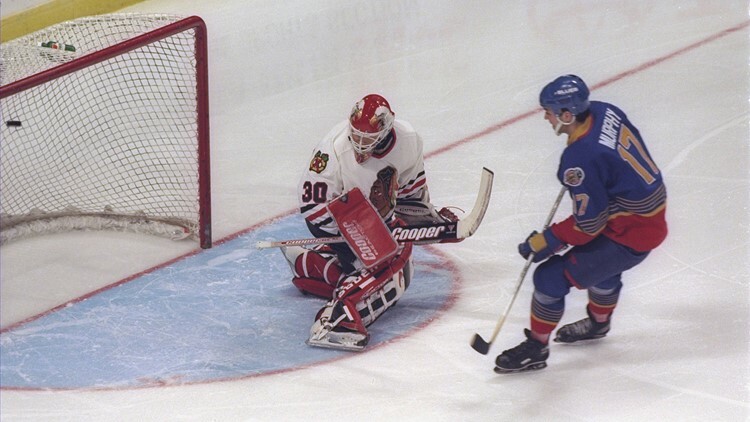 Rightwinger Joe Murphy of the St. Louis Blues sends the puck behind the Chicago Blackhawks goaltender during a NHL game at the United Center in Chicago, Illinois on Dec. 26, 1996. Finally, the Red Wings gave up on Murphy in 1989, trading him to Edmonton in a blockbuster six-player deal that, ironically enough, brought Carson to the Wings. It worked out quickly for Murphy, who became part of the Oilers' Kid Line that helped the Oilers win the 1990 Stanley Cup. As he bounced through the NHL, playing for a total of seven teams, there was a string of odd and erratic behavior. Some called him the Dennis Rodman of the NHL. Murphy had strange tryout with the New York Rangers in 1999, when he reportedly argued with members of the front office and accused somebody of throwing his skates in the river. He was suspended by the Boston Bruins in 2000 for an act of insubordination toward a coach. In December of that year, he was playing for the Washington Capitals when he was reportedly struck on the head with a glass at a Manhattan nightclub. Once his NHL career ended in 2000, it got worse. After he became the head coach and general manager of the Alliston Coyotes in 2013, Murphy was reportedly banned from the town’s facilities after an alleged disturbance. Back in Canada, the problems continued. In 2017, Murphy pleaded guilty to mischief after reportedly “trashing” a room at a budget motel. 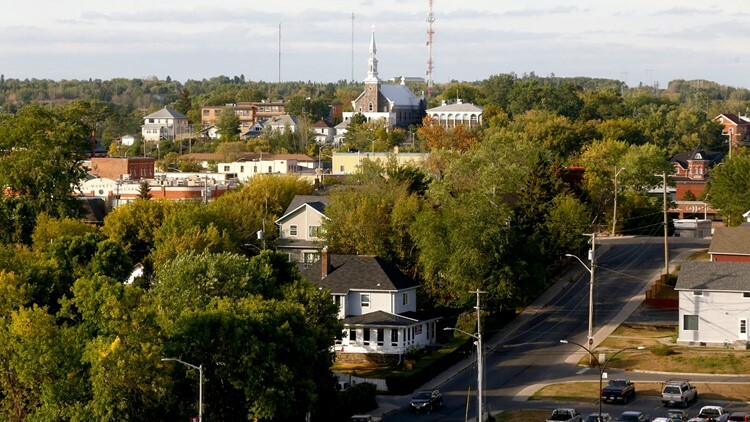 Then, Murphy moved to Sioux Lookout, a town of about 5,600 in northwestern Ontario. He got in a fight with a man and was charged with assault, according to court records. That case is what brought him to Kenora. He was transported by police and never left. Joe Murphy holds a cigarette with his fingers, the burning end toward his palm, so it won’t go out. He rests his head on concrete block. His coat is unzipped, his shoes off. His body curled in the fetal position, basking in the afternoon sunshine. His skin is tanned golden brown from living outside. “What has been the scariest night you have faced on the street?” I ask. A girl walks up from behind. “Got you a Gatorade, Joe,” she says, handing him a drink. He has become an unlikely celebrity in Kenora. Everybody knows his story. A man stops by to bring Joe Murphy a cup of coffee. People often stop by to give Murphy everything from McDonald's coffee to fruit and Egg McMuffins in the morning. People stop and give him food. Suddenly, he becomes overwhelmed with emotions. His body is battered from playing hockey. He busted his ankle once and he says he has had frostbite on both feet from living on the streets in winter. He has had more toes busted than he can remember — some from hockey, some from the streets. A few years ago, he ballooned up to 290 pounds after a bout of depression. He was drinking a dozen cokes a day. “I just didn’t care,” he says. Now his weight is under control, in part, because he walks constantly. In the morning, he walks from the gas station where he sleeps to the Anamiewigummig Fellowship Centre, located in downtown Kenora, next to the courthouse, about a half-hour walk. The Anamiewigummig Fellowship Centre as seen here is where Joe Murphy stops by daily to shower and sometimes pick up clothing. Murphy tends to be a loner and not associate with others while he is there. He showed up at the center for the first time in June. He never mentioned that he was the Joe Murphy, the guy who won an NCAA Championship at Michigan State and was a first-round draft pick of the Red Wings. Murphy’s biggest contract came in 1996 when he signed a three-year, $10-million deal to join the St. Louis Blues. If there is one constant theme in his explanations, it is that he has given away his money. Joe Murphy isn’t ashamed about living on the streets, for the choices he made. His pride comes from a different place, for how he played the game. As he talks, he slips back into a memory after losing against the Pittsburgh Penguins, although he can’t remember the year. Suddenly, it’s like he is back in the dressing room, talking to his teammates, although he can’t remember the team. This doesn’t seem like a memory. It’s like a flashback. He’s back in the moment, after a game, looking around the dressing room at his teammates. This man who is homeless, who barely has a penny to his name, has these amazing memories, which are like gold to him. Lemieux was his favorite player. “Best player in the league,” Murphy says. “With three goals and three assists,” Murphy says like a TV announcer, and laughs. “What team were you on?” I ask. Or maybe not. He can’t remember. Yes, hockey is a team game and there is an entire squad of former NHL players who are concerned about Murphy. Two are on the way to Kenora, to offer him some help. Joe Murphy sits by himself on a bench in the middle of town. He has no idea that help is on the way. That his life is about to take a sudden change. But that is still days away. It is early September and he starts rubbing his face like he is applying lotion. Rubbing and rubbing, even though he has nothing on his hands. He bursts into laughter, holding his face. He kicks his feet, leans back and rocks back and forth. Sunlight hits his face and he breaks into a giant smile. He is in his own world. He says he used to go spear fishing — “A French Jacques Cousteau!” he says — and he claims he once went to Michael Jackson’s house to try to meet him. Murphy has a new tent that he got from a man at the beach; no, Murphy bought it; no, somebody dropped it off; no, he gave it away. Murphy ends up telling four different versions of the same story in a matter of hours, and it’s not clear whether the tent even existed. 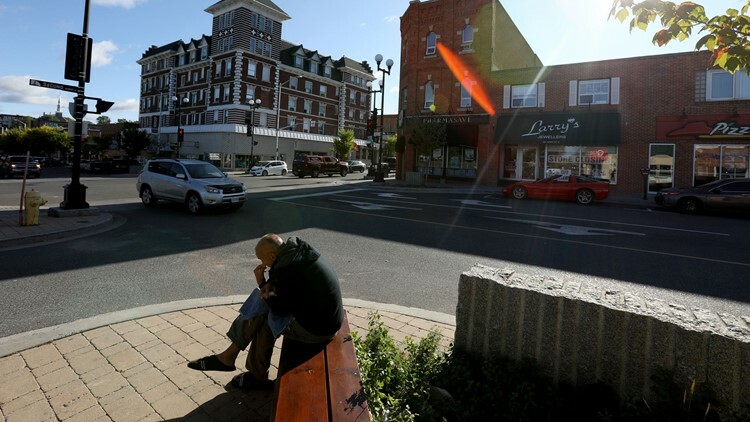 Joe Murphy sits on a bench in the heart of downtown Kenora, Ontario, Canada. He stands on a street in Kenora, points at a national chain business and says he once owned a large part of a company. He claims that he once owned a Gulfstream jet. He cracks jokes and plays dumb and then bursts out laughing. You never know whether he’s having a flashback or just screwing with you. He seems to zip back and forth. It can be the smallest thing that triggers him. No, Murphy didn’t start out like this. Before hockey, he was simple and grounded. “As a player, he was outstanding, he was extremely talented,” said Rick Kozuback, who coached Murphy, then 17, on a junior hockey team in Penticton, British Columbia. “He was a bit of a free spirit at times. We didn’t have any problems at all with Joe. Murphy set scoring records in junior hockey, helped lead Michigan State to an NCAA championship and was a scoring wizard for Canada at a world junior tournament when he was a teenager. Murphy played at Michigan State for that one championship season. “He was a very laid-back guy,” says Chris Luongo, who played with Murphy at MSU. When he was at MSU, Murphy was never one to make up stories, according to his teammates. He was never one to make grand proclamations like he does now. But the voice is the same. And his walk is the same. The same Murph who helped MSU win the national title. The same Murph who used to play for the Red Wings. In the short term, he needs a place to stay for winter. But people have been trying to help him for years — his family, friends, former teammates and coaches. Murphy’s family has started a GoFundMe page to raise money for his long-term care. They raised nearly $3,000, although none has gone to Murphy yet. Joe Murphy smiles while looking down the sidewalk in downtown Kenora, Ontario, Canada on Wednesday, September 4, 2018. Cole sent the GoFundMe link to his former players. That’s the key: When Joe asks for help. Murphy has yet to ask for it. In mid-September, two former NHL hockey players are on a mission. They fly to Winnipeg, rent a car and drive about two hours to Kenora, hoping to help Murphy. Healy is the executive director of the NHL Alumni Association. He has brought along Graves because he won a Stanley Cup with Murphy in Edmonton. But the question remains: Will Murphy accept their help? The other big issue is mental health: What exactly is wrong with him? In the basement of the courthouse, there is a specific courtroom devoted to mental health cases. “That court is designed for individuals who run afoul of the law and have issues regarding their mental well-being,” Iwasiw says. Murphy is working his way through this mental health court because he has been charged with assault. It is a voluntary, all-encompassing court, which tries to address all kinds of issues, ranging from housing, employment to mental health needs. Iwasiw has signed Murphy up for an assessment by a forensics psychiatrist, although it may take until November before there is an opening. Graves and Healy show up in Kenora with a couple of bags of clothing, a game plan and a strong determination: They refuse to leave until Murphy is in a better situation. There is a massive breakthrough. That is what everyone has been waiting for. Before anybody can help Murphy, he must be willing to accept it. Graves and Healy stay awake for 27 straight hours, working to get Murphy’s life straightened out. They get Murphy an apartment. They get him furniture and give him clothes. When the Free Press contacted Healy, he declined to comment on Murphy’s situation because he wants other players to trust him when he helps them. Because there are others like Murphy, guys who need help. Suffice it to say, Murphy is thrilled. He takes a picture of himself, wearing some of the new clothes. Somebody takes a picture of him, flashing two thumbs up, and he sends it to Healy. And just when you think this is the first step toward a happy ending, when you think everything is about to come together, there is a snag. “Something fell apart,” Iwasiw says. The apartment doesn’t work. It’s too far from the center of town, where Murphy’s life is, where he has his support. So they go to Plan B: Healy pays for Murphy to stay in a room at an extended-stay motel in Kenora. All of this could not have come at a better time because the weather has gotten worse. There is snow on the ground in Kenora. But now the hard work begins. They must figure out what is wrong with him. Maybe, the issue is tied to the concussions. Maybe, it’s all mental health. Maybe, it’s a complex combination, a stew of issues. Unraveling it will take time. Treating it will take even longer. That part of this journey is just beginning. The guy who spent the summer living under a gas station sign, the guy who curled up on a thick blue blanket, listening to wolves in the distance, the guy who has slept in a garbage container, is in a safe place. There is a plan to help him long term. And he is out of the cold.